It is generally the fastest method for legs and underarms. If you are using an ordinary shaver, never shave dry. Lather soap of shaving cream on to your skin and hair. (Best time for shaving hair is while having bath.) However, if you use an electric shaver, powder the skin first. 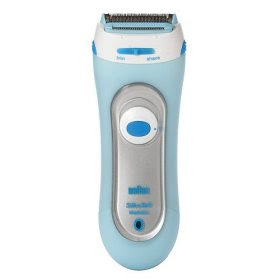 It dries the skin and helps the shaver glide smoothly. After shaving your skin may feel slightly uncomfortable, apply a mild soothing cream. There is a myth regarding shaving hair- that shaved hair grows stronger, thicker or coarser. The reason it may feel coarse is simply that as a result of shaving the new tips that grow through are blunt and not as tapered as natural hair ends, so they have a harsher feel and seem coarser. So, most women find it unacceptable for dealing with facial hair. Though shaving is a popular, inexpensive method of removing hair – it has another major disadvantage. The speed of which the hairs re-grow is fast – it can be within 24 hours also. This is not because shaving speeds up the rate of growth, but since only the surface hair is removed, the root and the hair beneath the skin are unaffected and the hair soon starts to reappear. hair growth starts inside the hair follicle which sits below your skin. nothing you do to the hair strand changes anything that goes on inside the follicle. when you shave you cut the hair strand blunt, straight across, so when it grows back it feels stubbly. when you wax or tweeze you pull the hair out by the root so instead of a blunt hair continuing to grow out of the follicle, you have a brand new hair that seems to be softer. To be honest shaving is a lot easier, it takes less time and is also more affordable. But the best thing for hair all over your body is waxing. Unlike shaving waxing actually pulls the roots out (shaving only cuts the tops off). Waxing is also better in the long run, it allows your legs to stay smooth and even in some circumstances it allows the hairs to stop growing. Waxing is more expensive and time consuming though. If you do end up shaving remember to moisturize after shaving to smooth the shin.